An unknown source of local food on campus? Local food, sustainability and fair trade have come to mainstream consciousness over the past few years, and as a result some businesses are shifting their policies. Some others are trying to appear to be doing so. I’ve been noticing these signs in the Terrace cafeteria at TRU over the past few weeks. 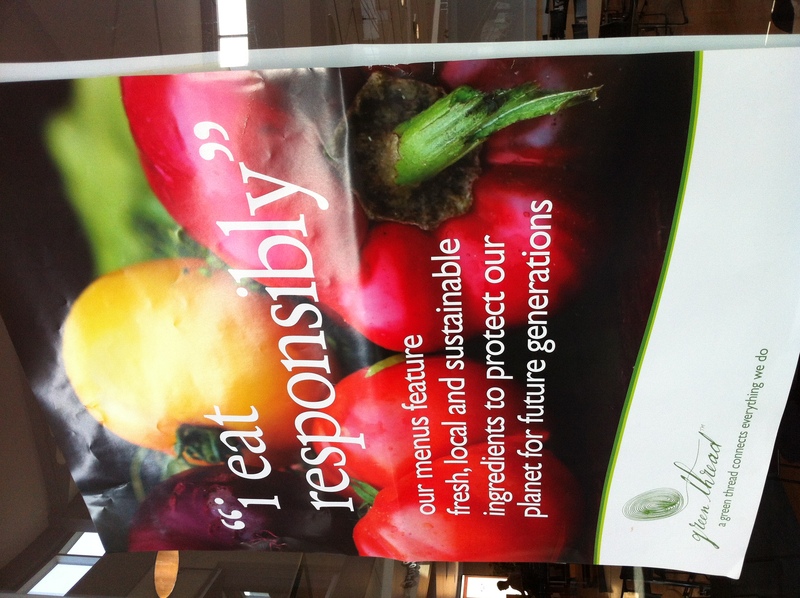 The posters are a part of Aramark’s “Green Thread” campaign, described by the company as part of its sustainable food initiative. Aramark provides the food on a great number of different university campuses across North America, as well as in colleges, high schools, remote camps, businesses and more. 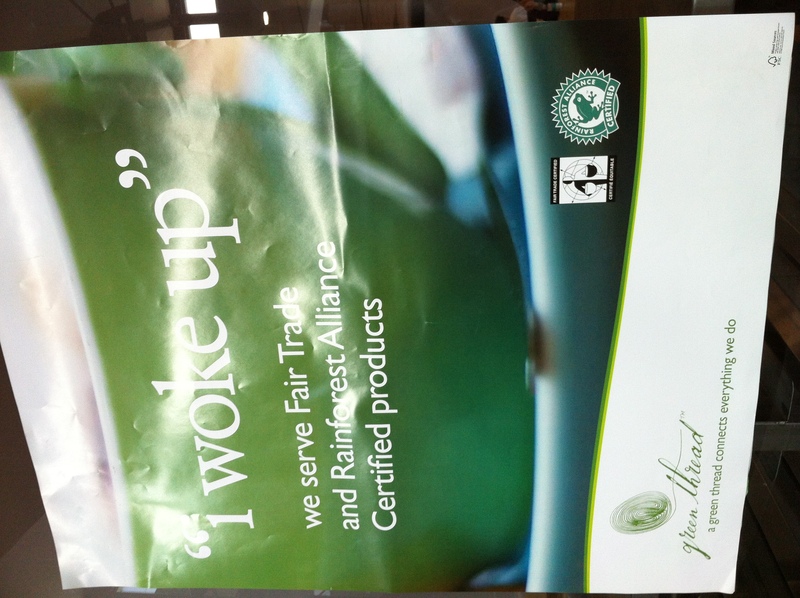 I wonder what action Aramark, the food company that runs almost all the food on campus at TRU, has taken on its stated commitments toward sustainability and local, organic and fair trade food? In 2010 Aramark published a press release announcing it had received an award as one of Canada’s greenest employers. It seems there is lots to learn, and I’d like to know more. 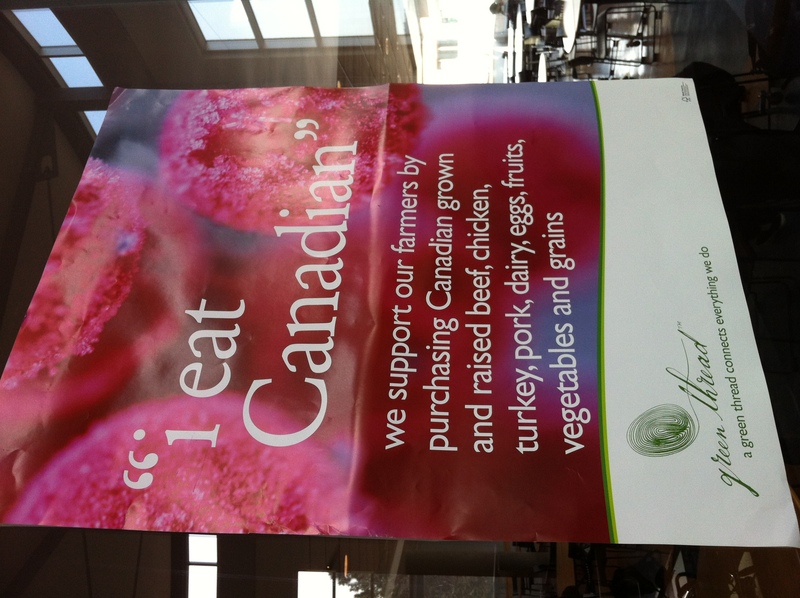 I wonder what percentage of Aramark's food is sourced within Canada? Photo by Larkin Schmiedl. "Whenever possible" depends partly on availability, and partly on the level of a company's priority toward sourcing local food. Photo by Larkin Schmiedl. 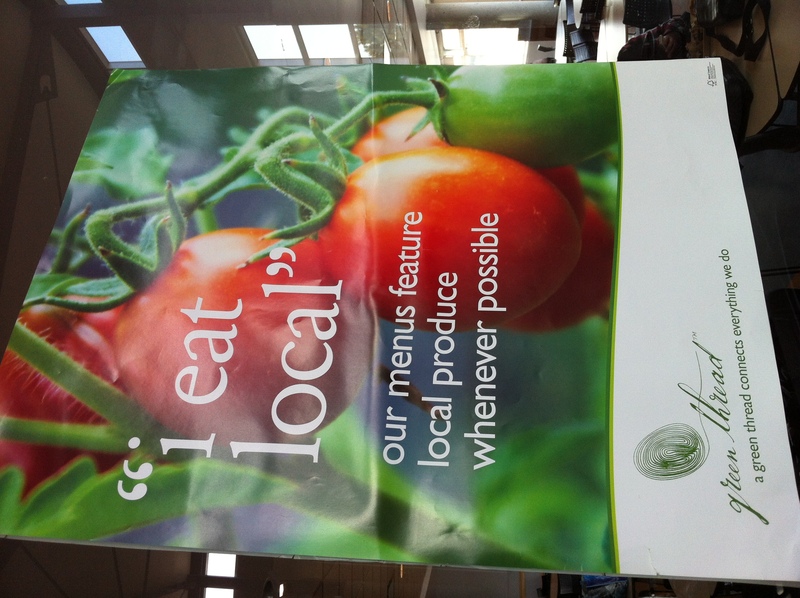 How much local food is served in this cafeteria, and what is meant by 'sustainable'? Photo by Larkin Schmiedl. 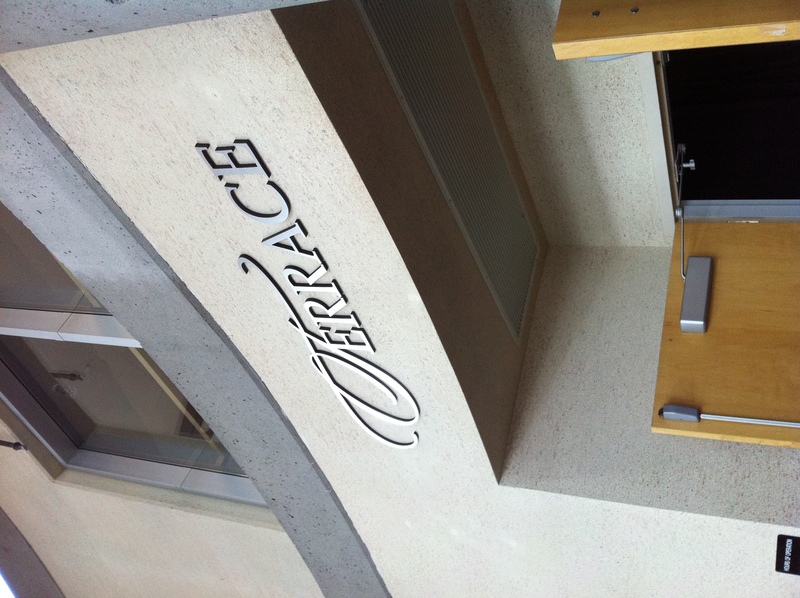 The Terrace, one of the main cafeterias on TRU's campus. Photo by Larkin Schmiedl. Christina Grono created, owns and manages The Art We Are, a local Kamloops café, restaurant and art gallery. She is also my former boss. As the owner of a restaurant who faces commercial pressures while striving to serve food that’s as local, organic and ethical as possible and also remaining affordable, I talked with her about the food her restaurant uses, what her personal ethics and goals are for the business, and what kinds of things come into question. 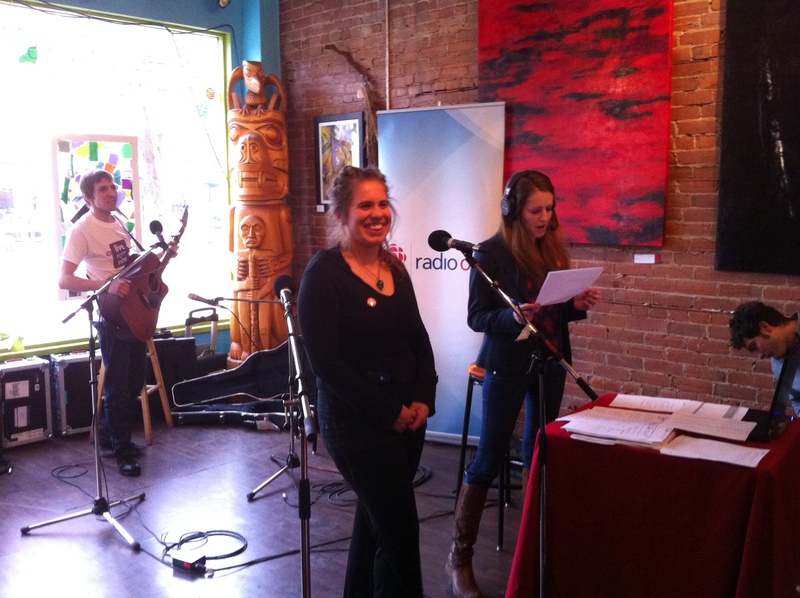 Christina Grono, owner of The Art We Are, was interviewed by CBC's Rebecca Zandbergen on Radio West live Mar. 2 at The Art We Are. Photo by Larkin Schmiedl. The Art We Are is a colourful local coffee shop, restaurant and art gallery that strives to be a community hub for music, art, relaxing and making connections. Owner Christina Grono was interviewed on site this past Friday Mar. 2, by CBC’s Rebecca Zandbergen of Radio West. The Art We Are is quite a unique business in Kamloops, both in terms of how it looks, and how it actually feels. As part of my project on this food blog I’ll be interviewing Grono this Wednesday. I’ll be looking at her philosophy behind her business, and how it coincides with the type of food The Art We Are uses. I’ll be talking with her about some of the ethical issues that arise for her as someone who is both a conscientious consumer while also being constrained by the limits of running a business. Stay tuned for more information on the interview coming up. 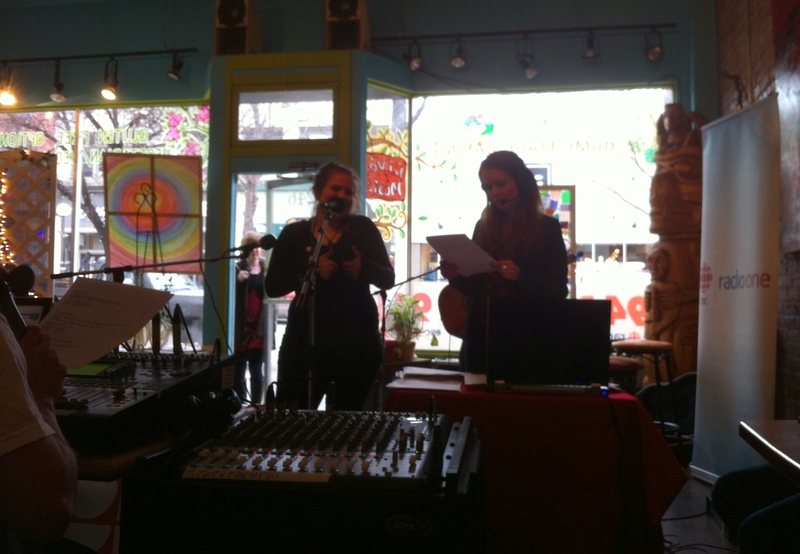 Christina Grono of The Art We Are interviewed by Rebecca Zandbergen of CBC's Radio West. Photo by Larkin Schmiedl.